Integration removes complexity within IT infrastructure. Demand for pre-integrated, vendor-certified systems containing server hardware, disk storage, networking and basic element management software are growing across the globe. Solutions that provide all compute and storage functions are gaining market momentum. According to the latest market study by International Data Corporation (IDC), the worldwide converged systems market increased revenue 1.7 percent year over year to $2.6 billion during the third quarter of 2016 (3Q16). The market consumed 1.4 exabytes of new storage capacity during the quarter -- that's up by 12.5 percent, compared to the same period a year ago. "The converged systems ecosystem is itself converging at the supplier and product level," said Eric Sheppard, research director at IDC. "On the product side, we find the strongest growth coming from offerings that have robust data services, high levels of automation, and strong lifecycle management capabilities." 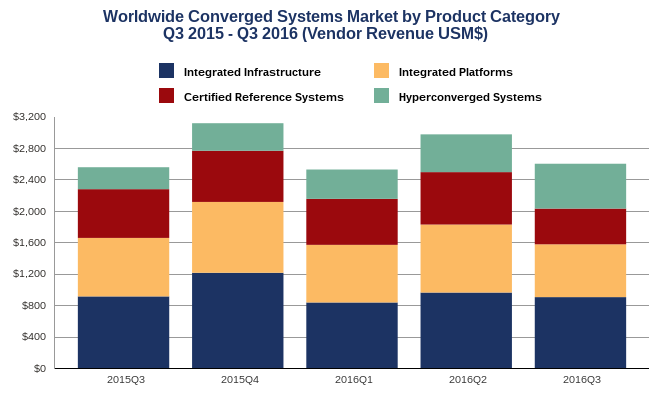 IDC's converged systems market view offers four segments: integrated infrastructure, certified reference systems, integrated platforms, and hyperconverged systems. Integrated infrastructure and certified reference systems are pre-integrated, vendor-certified systems containing server hardware, disk storage systems, networking equipment, and basic element/systems management software. Integrated Platforms are integrated systems that are sold with additional pre-integrated packaged software and customized system engineering optimized to enable such functions as application development software, databases, testing, and integration tools. Hyperconverged systems collapse core storage and compute functionality into a single, highly virtualized solution. A key characteristic of hyperconverged systems that differentiate these solutions from other integrated systems is their ability to provide all compute and storage functions through the same server-based resources. During the third quarter of 2016, the combined integrated infrastructure and certified reference systems market generated revenues of $1.36 billion, which represented a year-over-year decrease of 11.4 percent and 52.2 percent of the total market. Integrated Platform sales declined 9.7 percent year over year during the third quarter of 2016, generating $671.8 million worth of sales. This amounted to 25.8 percent of the total revenue. Hyperconverged sales grew 104.3 percent year over year during the third quarter of 2016, generating $570.5 million worth of sales. This amounted to 22 percent of the total market value.